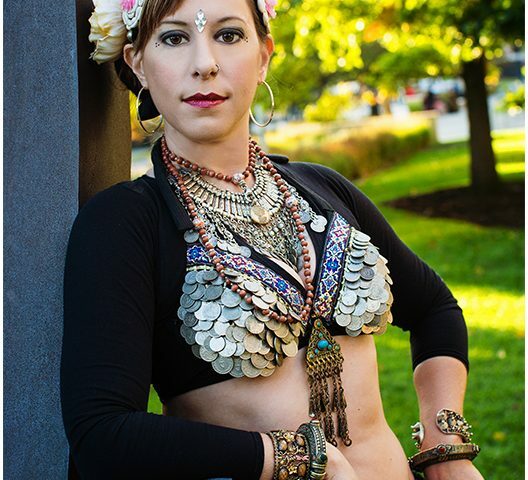 A lifelong dancer, Jenn’s belly dance background began in 2003, while living in the Middle East. After moving back to the United States, she studied American Cabaret belly dance from 2005 – 2007. 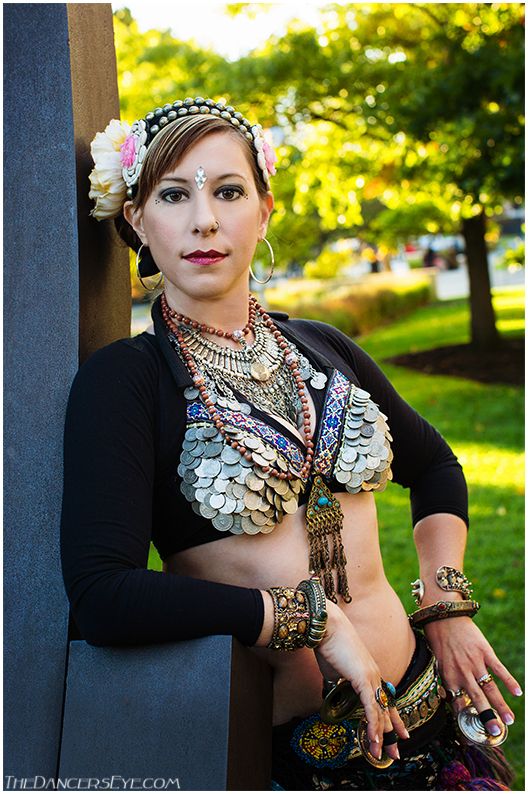 She was introduced to ATS® belly dance in 2007 and immediately fell in love with its aesthetic and philosophy. She found a local instructor and began taking private lessons, with the hope of joining a class when she moved to the St. Louis area later that year. In late 2007, Jenn moved back to her hometown of St. Peters, Mo. She was surprised to learn there was no ATS® in the St. Louis area and so joined a Cabaret group, Chuvani Belly Dance. She performed with them as a principal dancer and choreographer at the Greater St. Louis Renaissance Faire and St. Louis Pirate Festival for three seasons. All the while, she had her sights set on ATS® and spent time learning from the videos. In summer of 2009 she began what would later become Tandava Tribal Belly Dance by teaching a small group of local belly dancers. In October of 2009, Jenn earned her General Skills and Teacher Certifications in ATS® from Carolena Nericcio of Fat Chance Belly Dance® and became a Fat Chance Belly Dance® Sister Studio. In 2013 she co-founded the Missouri ATS® Collective known as “Show Me ATS” with Susan Warner of Project Shimmy in Kansas City. The goal of this partnership is to promote ATS® belly dance across the Midwest. Show Me ATS has successfully hosted several ATS® events, including General Skills and Teacher Training in St. Louis, MO in August of 2014. In 2015, Jenn became a Sister Studio Continuing Education Instructor, making her one of only a handful of certified ATS® Advanced Teacher Trainers worldwide.